Saturday night in Dallas was special. Over the course of the evening, 13 sets of competitors filed into the Octagon and fight-by-fight, they delivered, turning UFC 228 into one of the most exciting and entertaining events of the year. Featuring breakthrough efforts from Geoff Neal, Tatiana Suarez and Abdul Razak Alhassan and capped by a dominant performance by welterweight champion Tyron Woodley, the organization’s annual trip to “Big D” once again delivered. But with the dust finally settling at American Airlines Center, it’s on to the next one as the UFC breaks new ground by bringing the Octagon to Russia for the first time with a 12-bout lineup set to take place in Moscow this weekend. Headlined by heavyweight finishers Mark Hunt and Aleksei Oleinik and supported by a host of familiar names on the four-fight main card, Saturday’s UFC FIGHT PASS event has the potential to produce some spectacular finishes while introducing the audience to a collection of emerging talents from the host nation. It also marks the return of an intriguing light heavyweight contender, who kicks off this week’s edition of this series. This is On the Rise: Moscow Edition. The man affectionately known throughout the Internet MMA community as “Nicky Thrills” is back in the UFC after a four-fight sabbatical that saw him collect four straight stoppage victories, including a first-round knockout win over Emanuel Newton and a second-round victory over Fabio Maldonado. Krylov went 6-3 during his first stint with the UFC, splitting two appearances at heavyweight before moving down to light heavyweight, where he lost his debut to Ovince Saint Preux. The developing youngster then rattled off five consecutive wins to climb into the Top 15 and looked poised to perhaps become a factor in the 205-pound ranks, but after a first-round submission loss to Misha Cirkunov at UFC 206, he returned to the regional scene. Now less than two years later, Krylov is back and matched up with Jan Blachowicz in a contest that has the potential to turn the returning Ukrainian competitor into an instant contender. After an uneven start to his time in the UFC, the Polish veteran has found his footing, earning three straight victories, including a unanimous decision nod over Jimi Rivera back in March. 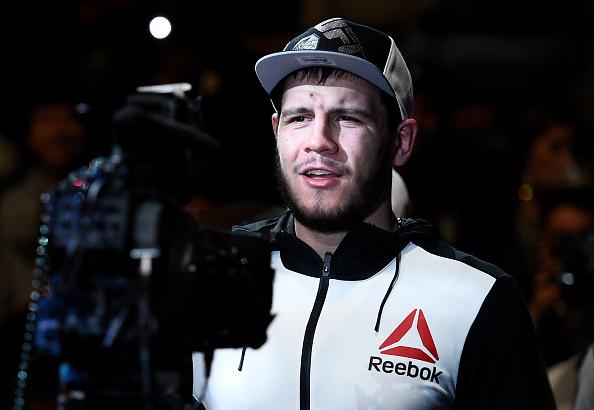 Still only 26 years old, Krylov already has 25 victories and 30 professional appearances under his belt and has looked dominant since departing the UFC. If he can carry that over into his return, “The Miner” has the potential to emerge as a dangerous new, but familiar, name to ponder in the light heavyweight division heading into the final three months of the year. Regardless of whom you’re fighting or where those bouts are taking place, earning 18 consecutive victories is always impressive. Kunchenko has achieved that feat competing in various Russian promotions over the last five years, including 10 victories under the M-1 Challenge banner. The 34-year-old claimed the organization’s welterweight title with a fourth-round stoppage win over Murad Abdulaev in April 2016 and defended it four times before vacating the belt to sign with the UFC. A Muay Thai practitioner with a high Fight IQ, Kunchenko has faced very little adversity while blazing a path of destruction to the biggest stage in the sport, but does that mean he hasn’t been tested or that he’s simply that good? That question should be answered on Saturday when he steps into the Octagon with Thiago Alves, one of the most experienced and respected veterans in the welterweight division. The former title challenger is coming off a loss to Curtis Millender in February, but faced an adverse road to their short-notice clash in Austin and plans on righting the ship on Saturday. Should Kunchenko maintain his unbeaten record and collect another stoppage win, he’ll establish himself as an intriguing dark horse in the 170-pound weight class who could get thrown in with the division’s elite sooner than you think. The first thing you need to know about Yandiev is that his nickname is the Russian word for “Beard” and that is awesome. For whatever reason, it feels like a generic, but fun “name him whatever sticks out about him most” type of nickname, kind of like how Adam Driver was called “Ears” when he was in the Marines. Actually, he was called “Ears Two” because there was already an “Ears One” in his unit. True story. I don’t know if anyone else finds that endearing, but I do, but maybe that’s just because I’ve had a bunch of terrible nicknames that I’m not going to share with you right now and “Beard” or “Ears Two” both sound lovely to me. More important in terms of this weekend, however, is the fact that the 30-year-old judoka is 9-0 with nine first-round finishes heading into his matchup with Jordan Johnson, who subbed in for Krysztof Jotko when the Polish veteran was forced out with an injury. Like Yandiev, Johnson is also 9-0, having collected decision wins over Henrique da Silva, Marcel Fortuna and Adam Milstead since arriving in the UFC. The former two-time All-American from the University of Iowa is a formidable opponent for the Octagon neophyte, and while “Double J” currently isn’t ranked, an impressive performance from Yandiev could vault him into the Top 15 in just one fight.